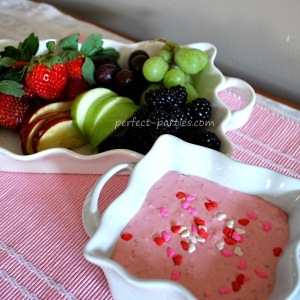 This strawberry flavored fruit dip is easy to make and will be a hit at your party. Serve with sliced apples, strawberries, grapes and pineapple spears. This is easy and quick! Blend, chill and add a few sprinkles to make the party perfect dip both kids and adults will enjoy. In a medium bowl, mix the strawberry-flavored cream cheese, marshmallow together until well blended. Add Cool Whip and blend into mixture. Chill at least an hour before serving and add sprinkles on top if desired. Serve with sliced apples, grapes, strawberries or pineapple spears. You can change the cream cheese to blueberry or pineapple. You can also enhance or change the color by adding a couple drops of food coloring. Using fresh strawberries is the key to this delicious fresh tasting dip. Perfect for dipping cut fruit like apples, pineapple pears, strawberries and melon. This dip has a thinner consistency and can easily spooned onto a bowl of fruit and served. Use fresh strawberries to make this easy dip. 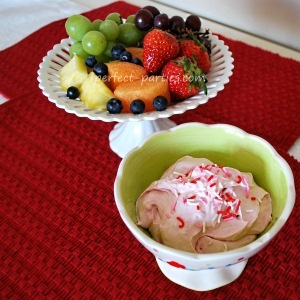 Add a few colorful sprinkles on top and serve chilled with cut fruit for dipping. Cut tops of strawberries, and cut in half. Put Strawberries into food processor and blend until smooth. Mix cream cheese in bowl until smooth. Add strawberries, sour cream and sugar to the cream cheese and mix well. Chill and add sprinkles on top if desired. Note: If you puree it all, it will be smoother but on the runny side. Check out our other site!